Watch a day in the life of an electric vehicle charging station in a special National Plug-In Day video release from Nissan showcasing LEAF owners who utilize a DC fast charger and talk about daily life with their electric cars. In this fun video report, Nissan lets LEAF owners in the Nashville, Tennessee area talk about their cars and everyday ownership of an electric vehicle. Staged at a public charging station in the city, the video showcases the owners of Nissan LEAF cars and how they've adopted the EV into their lifestyle and how happy they are to no longer be spending money at the gas pump. Produced for National Plug-In Day, the video is about two minutes long and is a fast glimpse into how electric driving has changed people's lives. A quick charge on a DC fast charger, as shown here, takes about twenty minutes for a mostly-drained LEAF. The people in the video are everyday folks, not nerds or early adopters, but people who bought a LEAF because they saw their neighbors with one, talked to someone else who had one, or just wanted to get off the gas pump habit. "At first it was just technology lovers who were early adopters. But EV customers have moved from early adopters to a more diverse and representative group of customers. They span all age groups and most income brackets. The EV customer base is increasingly more representative of the overall US population," said Nissan Director of electric vehicles marketing and sales strategy Brendan Jones. "Also now the infrastructure makes adoption so much easier. 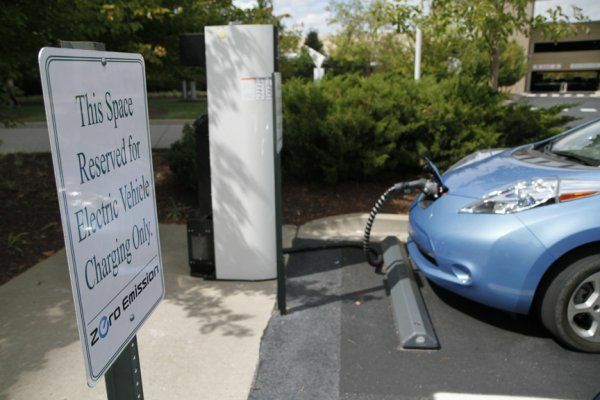 We are working with companies, schools, businesses and governments to install more chargers across the country." In the video, we meet LEAF owner Jaime Hutton who routinely parks her car in front of the charging station to each lunch and check her emails. During that time on her lunch break, the car is recharged to full. Another owner, Ashith Raj, parks his car at the charger to recharge on his way to work on his sixty mile commute. LEAF owner Cheryle Hanrehan makes a lot of short, quick trips - the kind that are particularly hard on gasoline-powered vehicles - and says she saves a lot of money by not having to pump gas.